LAHORE: (Wednesday, August 1, 2018): Punjab University Vice Chancellor Prof Niaz Ahmad has said that the country and society could not progress until we ensure quality teachers, graduates and curriculum as per international standards. He was addressing the 24th Convocation of Queen Mary College held at Faisal Auditorium here on Wednesday. Queen Mary College’s Principal Prof Dr Irfana Mariam, faculty members and a large number of students were present on the occasion. 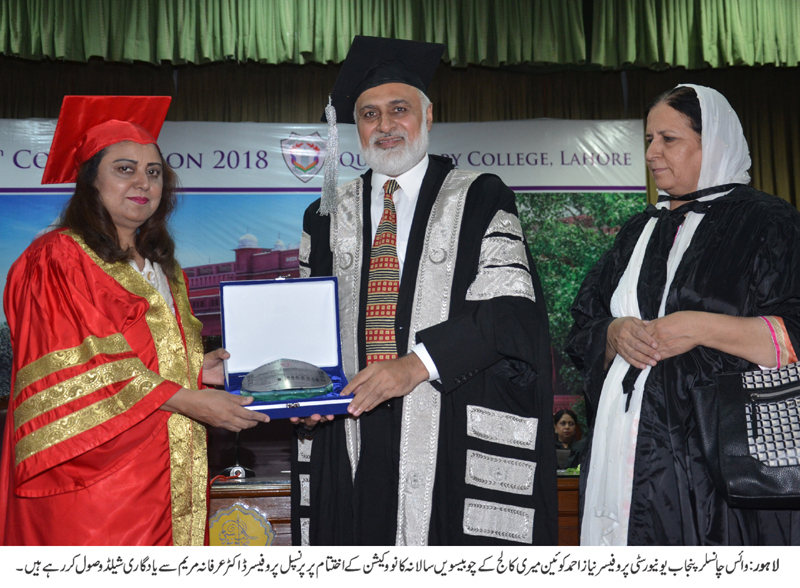 Addressing the ceremony, Prof Niaz Ahmad said that women’s education was more important than men’s because an educated mother could play important role to establish civilized society. He said that unfortunately only 35 percent teachers in higher education sector were PhDs and this number must reach 100 percent. He said that we had no option except to work on merit because now it was the age of survival of the fittest. He said that it was the basic responsibility of universities to create and transfer knowledge and the country and society must benefit from it. He said that a large segment of country’s population consisted of youth and country’s future was in their hands. He said that our youth had important role to play in country’s development. He said that there was no need to produce such graduates who did not have any skill. He said that this was the age of technology which was rapidly changing and if we did not match this speed, we would be left behind. He said that the people who spoke against Pakistan could see that today’s Pakistan was the strongest Pakistan ever. He advised the students to master their subjects and strengthen their character. He congratulated the graduating students on successful completion of their degrees from one of the most prestigious colleges. 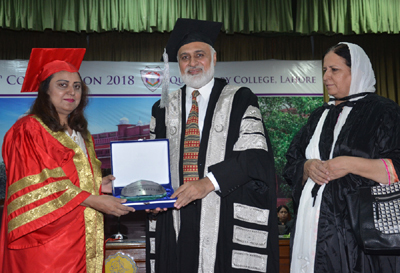 College Principal Prof Dr Irfana Mariam said that educational programs and policies played a pivotal role in the social and individual progress. She said that education could create a safer, healthier and more prosperous world to be considered within the framework of social relationships. She also presented a detailed report of college’s progress. As many as 27 gold medals, 9 silver medals and 27 roll of honors were distributed among the distinguished students. Around 1500 degrees were awarded to the students of various academic programs of the college.